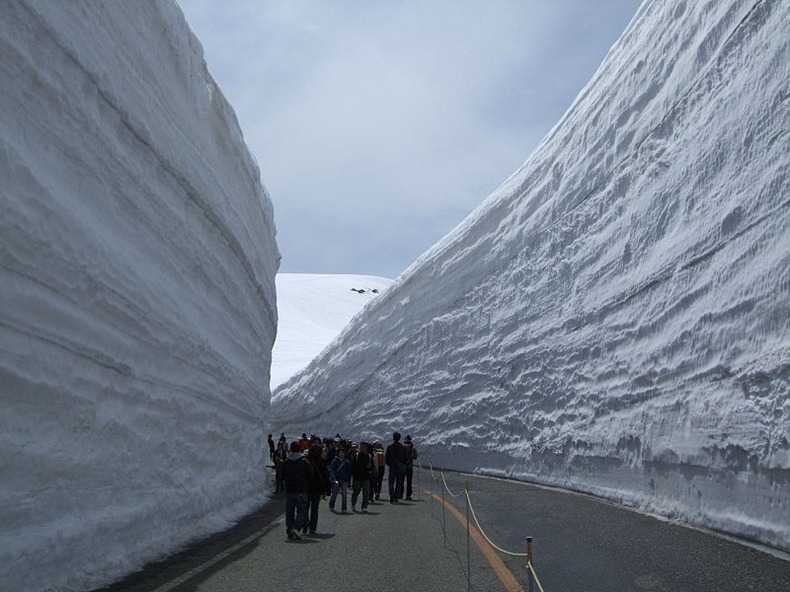 Home / 56 feet of snow / asia / bijodaira / chubu sangaku national park / hoshu / japan / japanese alps / kurobeko / mountains / murodo / northern japan alps / ogisawa / snow wall / snowfall / tateyama kurobe alpine route / tourists / So You Think You Have Snow? So You Think You Have Snow? The bus drives through snow wall between Bijodaira and Murodo in Tateyama, Japan. In April 2010, the snow remover cars get the snow on the road off by using GPS with an accuracy of centimeter. The snow wall is 15 meter high. The Tateyama Kurobe Alpine Route is a unique and spectacular route through the Northern Japan Alps, which is traversed by various means of transportation, including cable cars, trolley buses and a ropeway. The route is particularly famous for the high snow walls that line some of its roads in spring. The Tateyama Kurobe Alpine Route was completed in 1971, and connects Toyama City in Toyama Prefecture with Omachi Town in Nagano Prefecture. The route was carefully built so that the surrounding environment is not damaged. Consequently, three lines go entirely under tunnels; among them, two are trolleybus lines. Trolleybuses have all gone from Japan, except for these two lines which are still used here as they don't exhaust gas. The route goes through Tateyama in the Hida Mountains with a lot of scenic sites, including Kurobe dam. The section between Kurobe Dam and Ōgisawa was originally made for construction of the dam, while the section between Tateyama and Kurobeko was for tourists from the beginning. Currently, the route is purely a sightseeing one, only used by tourists. The main attraction that draws the crowd to this route is the magnificent scenery of the Tateyama Mountain Range, part of the Chubu Sangaku National Park. The 15 meter high snow corridor is a highlight during spring, while alpine flowers and autumn colors attract hikers during the summer and autumn. Along the route, some stations have hotels around them that are used as bases for mountain climbing or trekking. Kamchatka, Russia! Is This the Most Magical Cave in the World? Yeah? here in Norway it can get to over 16 metres deep!